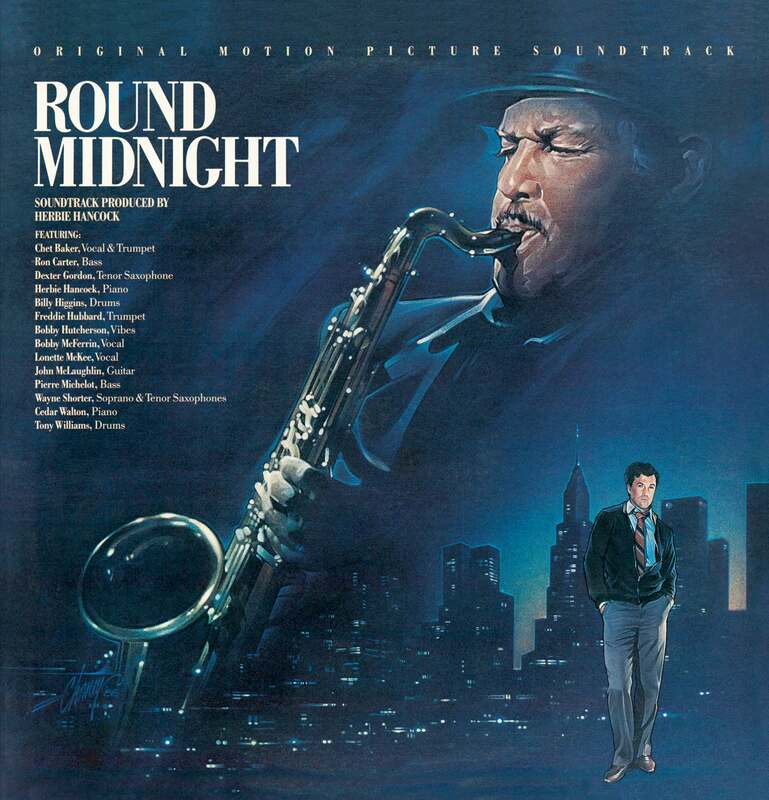 “Early in 1985, Bertrand Tavernier, a longtime jazz and Hancock aficionado, offered Herbie the opportunity to write the score for Bertrand Tavernier’s film, Round Midnight and to appear in the film. Based on the story of Bud Powell and Francis Paudras’ friendship with him, and on excerpts of Lester Young’s life, the film tells the story of an expatriate American sax player in Paris, who is befriended by a French jazz fan striving to cure the jazz musician’s alcohol abuse. The cast features many real jazz musicians, most prominently Dexter Gordon in the leading role – and Herbie Hancock in the side role of pianist Eddie Wayne. As Herbie Hancock and I were quietly strolling about the set of the Blue Note, which was under construction at the Epinay Studios, he voiced his deep concern over the picture’s sound. He had every reason to feel nervous. I had decided that all the music in the film would be recorded live: we would never use the playback system. It would be the first time that the whole score would be done this way in a fictional feature film. This unusual project had started a few months earlier when Warner Bros. gave Irwin Winkler and myself the green light. For many years, I had been struggling to make a totally free, genuine, and uncompromising film that would testify to my passionate love for jazz, especially bebop. Getting Herbie’s support was a major step towards realizing that dream. It was around midnight when the phone rang: “Hello, this is Herbie Hancock. I just finished reading the script and I cried. I felt so proud to be black and a jazz musician.” On my first meeting with Herbie, we immediately agreed on certain principles. We wouldn’t try to duplicate exactly the music of the fifties. Otherwise, declared Herbie, “we might just as well use the Blue Note records.” We wanted to avoid a rigid or scholarly approach to the musical style. Herbie and Dexter Gordon chose most of the musicians, while I suggested Pierre Michelot, the rigorous bassist who had played with Bud Powell and Miles Davis. Filming the music live was a real challenge for the musicians, the crew, and myself. We never really knew where we were going and there could be enormous differences between two takes. This made the shooting a deeply moving and stimulating adventure. I have to take my hat off to Herbie, who never lost his cool. He found solutions to every problem, and was ready for any challenge, whether it be rewriting an arrangement or even abandoning it in order to invent a completely different one. An ideal collaborator, he adapted to every style and personality with tremendous grace and good spirits. Listen to Herbie’s piano solos in “The Peacocks.” It’s a marvelous interpretation of a unique composition by Jimmy Rowles. Or the harmonies he weaves behind Bobby Hutcherson’s ‘begging notes’ in “Minuit Aux Champs-Elysées”, a beautiful theme by Henri Renaud which rivals Django Reinhardt’s melodies. Herbie also wrote several original compositions for the film. I still get goose bumps when I hear how he inverted the harmonies of Bud Powell’s “Time Waits” for “Still Time”, I’ll never forget our enthusiasm when Herbie, after along day’s work and screening of the dailies, re-orchestrated “Bérangere’s Nightmare” in order to create the more tempestuous version that I wanted. Full of dissonances, it was so impassioned that in the end Billy wasn’t even playing the tempo anymore, lost in clashes of color, and Herbie was composing incredible chords on the piano. His third original composition, “Chan’s Song (Never Said)”, was a very pretty ballad for which he did four totally different arrangements, with the panache of a virtuoso; a quintet with Dexter, a piano solo, a full orchestra version with Wayne Shorter and Lonette McKee, and a trio with Bobby McFerrin. Recorded July 1-12, 1985 by William Flageollet at Studio Eclair, Epinay Sur Seine, France. Additional recording at Studio Davout and Studio Philippe Sarde, Paris. Mixed by William Flageollet at Studio Eclair, Epinay Sur Scene.